Applications are invited for a 6-month Paediatric Anaesthesia Fellowship positions starting in July 2018 at Lagos University Teaching Hospital (LUTH) and University College Hospital (UCH), Ibadan, Nigeria. Application Deadline: 28th February 2018. About the Award: The programme is intended for fully qualified anaesthesiologists working in low resource settings who wish to develop knowledge and skills in the field of paediatric anaesthesia. Preference will be given to anaesthesiologists aged 40 years or younger who are working in African countries. Older anaesthesiologists may apply and the selection panel will consider each applicant’s place of work and other factors when making its decision. LUTH is a 770 bed teaching hospital with 3 paediatric wards and 1 paediatric surgical ward, a 5 bed Intensive Care Unit (ICU), 38 bed neonatal ward, a Special Care Baby Unit (SCBU), as well as a 26 bed-space children’s emergency room and 12 operating theatres. UCH is a tertiary teaching hospital with 888 beds. The 15 bed ICU consists of 8 ventilated and monitored beds. Other facilities in this hospital include a SCBU (30 beds), 4 paediatric wards and 1 paediatric surgical ward as well as a Children’s Emergency Ward. Over 2,500 children are seen and treated annually in the Children’s Emergency Ward. Must be supported in their application by their own national anaesthetic society. Must be supported in their application by the chief / head of their home department. Must be returning to their home country to train others. Value of Award: The fellowship offers funding for accommodation and a contribution towards living expenses. Duration of Program: The duration of the fellowship is 6 months. The start date is expected to be the 1st June 2018. How to Apply: In order to apply please use our online application system here to complete an application form and upload the following documents. 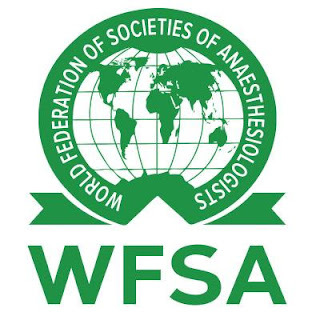 Applications will be considered by a panel of anaesthesiologists selected by WFSA, and successful applicants will be informed before the end of Feb 2018. Successful applicants must confirm their intention to take up the scholarship within 2 days of notification. Failure to do so will result in the scholarship being offered to the next applicant.